My goal for this project was to create a web page that could control an 8×8 LED Matrix. I picked up an arduino started kit from Amazon, and initiated the project by working through the 8×8 Led Matrix Tutorial that came with the kit. I found ygricks’s Pen ‘arduino custom chars creator‘ which was close to what I wanted to do, but not exactly. This pen uses a 5×8 grid, and I needed an 8×8 Grid. So I forked it and started tweaking the layout so that it would look better in a smartphone browser and match the look of the LED Matrix I would be using. 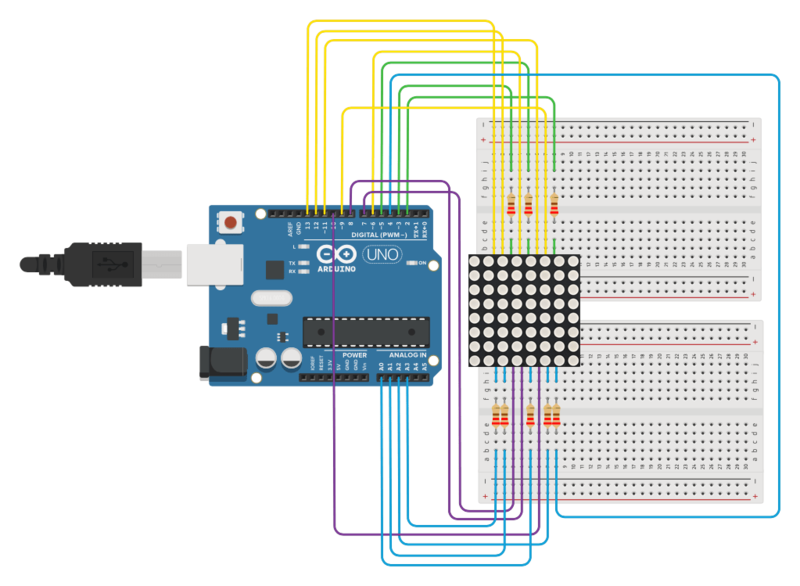 See the Pen Arduino 8×8 LED Controller by Troy Finamore (@findes) on CodePen. Next I went back to the method I used for my Internet Controlled Arduino LED via USB which uses processing to read a text file from a web server and to load the contents into the computers serial communication port. Since I was now sending a string of data instead of a single integer, I had to make some tweaks in the Processing sketch to test to make sure the string was changed before updating the variable in the communications port. Then to add the code to the arduino tutorial file to read the string and control the LED Matrix. If only it were that simple. I was running into errors trying to convert a string to hex format. Thinking it would be easier to just use the binary format, I rewrote the code and tried that for a while, but still had the errors of trying to convert string to binary. After a week of frustration I decided to reach out to the arduino community but go not love there. So I started talking to other faculty with arduino experience to see if they had any ideas. Then one recommended that instead of trying to convert the string to binary, why use an if statement to test if string == “1” then set binary = 1. While this was not my final solution it did set me on the track that would eventually lead to the final solution. Back to the interwebs looking for alternative approaches that may help, I eventually found code that controls the grounding of the individual leds, now by testing the string I could control the ground and it worked! By tweaking my JS file to remove the commas and just pull in the binary string, I could then loop through the string in the Arduino and create a multi-dimensional array similar to the structure of the matrix, then loop through that new array and control the grounding of the individual LEds. This is also dependent upon a lot of technologies. Maybe my next step should be looking into using an ethernet shield or an Arduino Ethernet and create it as a stand alone thing.